If you’ve recently purchased a used car in the past or know someone who has, you may have come across an unsightly sticker or decal left on one or more of the vehicle’s windows. While the original owner may have found this auto accessory as an attractive addition to your ride, chances are you don’t feel the same way. Removing decals like these can be a nerve-wracking task, especially if the decal has been sitting on the window for multiple years, but the right tools and procedures will make the process much simpler. The good news is that when it comes to streak free and smudge free windows in your car, it is more about the technique and the cloth, than it is about finding “the best” window cleaner. Start by gathering the items you’ll need to take off your car’s decal most effectively. These tools include a commercial razor blade, a window cleaner and a razor blade holder for added safety if you can locate one. Both the razor blade and holder can usually be found at a minimal cost at your local hardware or automotive store. The razor blades are usually sold in packs, but some specialty stores sell them individually as well. Standard household glass cleaner is all you really need to get the decal or sticker off of your automobile’s window, but if you have the opportunity you may want to invest in a small can of commercial foaming glass cleaner. After you’ve collected your materials, spray the decal with glass cleaner and let it soak for a few seconds. Once the decal has had a chance to absorb some of the glass cleaner, begin to slowly peel away the decal on any of its corners. For maximum effect, be sure to introduce the blade to the sticker at an angle, somewhere around 45 degrees. Doing so will give the razor blade a better opportunity to get underneath the automotive decal. Make sure you don’t put any more force on the razor blade than absolutely necessary as swapping your decal for fresh scratches is not the best of trades. If you find a decal or sticker on your vehicles back windshield, exercise extreme caution before attempting to remove it. Those black horizontal lines that run across the width of your back window are responsible for delivering heat to the rear windshield of your car, truck or SUV. Damaging any of these small coils could cause permanent damage to the defrost feature of your back window, so try to avoid contact between the razor blade and these heating elements at all cost. If you find a decent sized corner of the sticker peeled off of the window, attempt to remove it the rest of the way by hand. Utilizing the razor blade as little as possible will help reduce the chances of accidental damage to your vehicle’s expensive glass. Thin or especially old decals may break into pieces when removed by hand. If you find this to be the case with your decal, simply proceed as normal using the razor blade until the automotive decal has been removed completely from your car’s window. Once you have removed the offending sticker from your car, truck or SUV, you may find a sticky residue left behind. If so, gently chisel away at the remaining residue with your razor blade at the same 45 degree angle you used to peel the decal away. 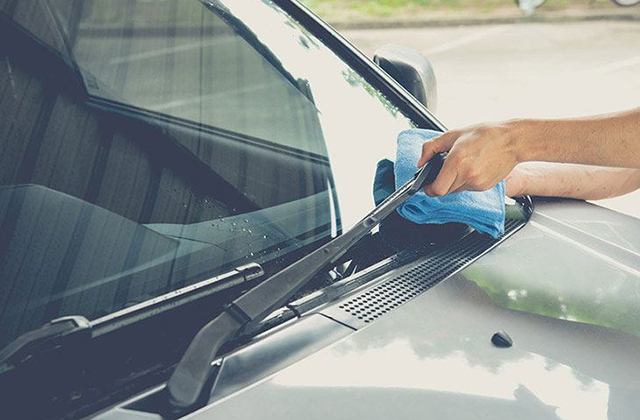 Once the decal and any leftover residue has been removed from your vehicle’s exterior, use some glass cleaner to give your window one last polishing and wipe away any remaining cleaner with a paper towel. Your car windows are now completely free of foreign decorations left by the previous owner. You may choose to leave your windows bare or accent them with attractive automotive decals of your choosing. You can choose here for more car window cleaning products.